Strong is different from indestructible.That is exactly how our teeth are. Over time, the layers of your teeth get worn out and as a result, your teeth get damaged and at times, broken. 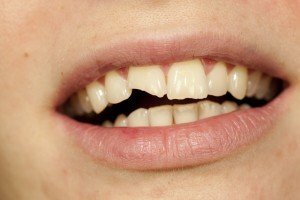 Having a broken tooth is one of the most common dental emergencies that occur. Whenever these unfortunate circumstances arise, it is important that you consult your trusted dentist immediately to address this concern with a sense of urgency. If there is bleeding, apply pressure on the area using a piece of gauze or a tea bag. Apply a cold pack on the area of the affected tooth to reduce pain and swelling. Go to your dentist right away. There are a number of ways in which your teeth break and each of these would require different approaches in handling the situation. Minor cracks – also called craze lines, which only affect the outermost layer of the tooth. The dentist will polish the affected area to smoothen the rough spots. Chips and cracks – can easily be addressed using Tooth Fillings to make your tooth look and feel a lot better. If the crack exposes the nerve and other tissues inside your tooth, a Root Canal Therapy might be needed. Broken cusp – affect only the chewing surface of the tooth and not the inner parts. Composite resin can be used to restore the chewing surface. Also, a crown or an onlay might be recommended. Split tooth – usually treated in three phases: root canal therapy, and installation of a dental crown. In some severe cases, the entire tooth is removed. Decay-induced break – results from an untreated cavity. This will be evaluated by the dentist first to determine the extent of the damage. If the decay has already affected the bone, the tooth will have to be extracted. When your precious teeth get damaged, it is important that you consult your dental care partners here at Precision Dental immediately. Your trusted dentist in Brisbane can provide you with a comprehensive set of dental treatments that aim to restore your teeth and your smile to perfection. Using the most advanced tools and techniques used in modern dentistry, we can easily bring back your healthiest and most beautiful smile. Call us today on (07) 3852 1160 or book an appointment online.